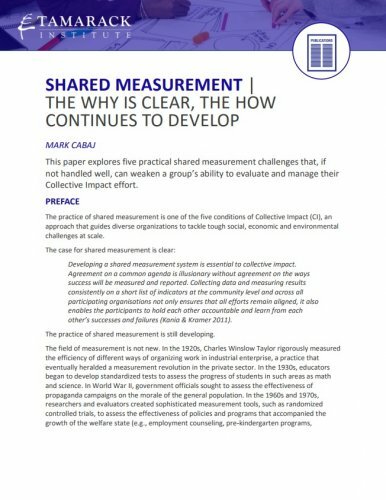 The practice of shared measurement is one of the five conditions of Collective Impact (CI), an approach that guides diverse organizations to tackle tough social, economic and environmental challenges at scale. Developing a shared measurement system is essential to collective impact. Agreement on a common agenda is illusionary without agreement on the ways success will be measured and reported. Collecting data and measuring results consistently on a short list of indicators at the community level and across all participating organisations not only ensures that all efforts remain aligned, it also enables the participants to hold each other accountable and learn from each other’s successes and failures (Kania & Kramer 2011). The practice of shared measurement is still developing.